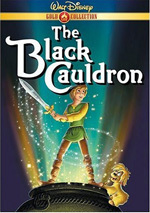 Tired of living in a Medieval mess, Merlin uses all his magic powers to change a scrawny little boy into a legendary hero! 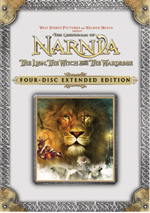 With fun, excitement and a captivating story, The Sword in the Stone is the perfect DVD for the whole family! Although most of 1967’s The Jungle Book was completed during Walt Disney’s lifetime, it nonetheless wasn’t finished until after his demise in December 1966. As such, that left 1963’s The Sword In the Stoneas the final animated release he would see. While the film has its moments, Sword seems like a weak epitaph, and it’s become easily the least recognized Disney release of its decade. Since the studio had difficulty coping with the loss of its founder, the Sixties and Seventies marked an extremely slow period for animation from Disney. Actually, that might have been the case even if Walt lived; he’d become much more interested in other venues - especially his theme parks - and production of animated films slowed. As such, the Sixties and Seventies only offered three animated movies apiece. In addition to Jungle Book and Sword, the Sixties also featured the highly successful 101 Dalmatians. As for the Seventies, they lacked the big hits seen in the prior decade. It was three bombs and out: 1970’s The Aristocats, 1973’s Robin Hood, and 1977’s The Rescuers. For the record, each decade also featured some live-action films that included a little animation. Again, the Sixties proved to be the big winner. Only one of these hybrid flicks appeared, but it was a huge hit: 1964’s Mary Poppins. The Seventies gave us 1971’s fairly fun Bedknobs and Broomsticks and 1977’s atrocious Pete’s Dragon. Not until the late Eighties with The Little Mermaid would Disney animation finally get back on track. In retrospect, The Sword In the Stone clearly marked the start of “the Dark Ages” at Disney’s animation studio. Frankly, I’ve never been especially fond of The Jungle Book, but it made a boatload of money and it is too highly regarded to a lot of people to be seen as anything other than a success. That means it doesn’t belong in the same category with the clunkers of the Seventies and most of the Eighties. Sword does, however. Actually, in many ways, it’s a decent little film, and it presents a number of quality segments. That fact sets its apart from the duds of later years, since they were bland and lifeless in most departments; at least Sword boasted a few fun pieces. However, its fragmented nature is what keeps it from ever approaching a high level of quality. More so than almost any other Disney flick, Sword feels like little more than a collection of loosely related shorts. The film attempts to tell the story of the youth and training of King Arthur. As depicted in the movie, “Wart” is about 11 and he’s the foster son of tubby blowhard Sir Ector, who - along with his favored son Kay - does little more than load work on Wart. He’s the number two boy, and that seems unlikely to change. Or is it? Into the picture steps Merlin the wizard. His skills have foreseen potential greatness in Wart, and he takes it upon himself to educate and train the boy for his future role. Most of the film depicts the exercises through which they go. Not until the end does Wart actually deal with the eponymous sword; as set up at the movie’s start, this blade was magically stuck in an anvil, and only the true king of England will be able to remove it. Since we know Wart is Arthur of the Camelot legend, this renders the film’s ending as rather anti-climactic. Actually, the movie simply stops abruptly. After about 70 minutes of Wart ‘n’ Merlin escapades, the story rushes to send Arthur to his destiny, and once he becomes king, it just kind of… ends. This makes the whole thing feel like little more than the start of a saga, but the rest of the series never arrives. Had there been a continuation in a later film, the flaws of Sword may seem less problematic, but as a “stand-alone” flick, it feels incomplete. On their own, some of the snippets are a lot of fun. Most prominent is the battle between Merlin and nasty old Madam Mim. Although the latter’s presence actually accentuates the semi-incoherent nature of the plot - the character exists for no reason other than to provide some fun - the segment is strong enough to allow us to ignore that lack of purpose. She’s wild and manic and contrasts cleanly with the bland participants of much of the rest of the movie. Many Disney flicks feature rather generic protagonists, and Wart is no exception. He has very little personality and never gives us any idea that he’ll become the legendary King Arthur. Lots of films deal with children who seem to be predestined to leadership. This was well-shown in Terminator 2, as John Connor indeed developed a strong character arc, and despite Jake Lloyd’s atrocious acting, at least some of Anakin Skywalker’s potential came through during The Phantom Menace. Wart, on the other hand, is a total cipher, and he shows no signs of charisma or greatness. It didn’t help that - bizarrely - three different actors perform Wart’s lines. Rickie Sorenson does most of the work, but we also hear dialogue from Richard and Robert Reitherman, sons of director Wolfgang. It’s not clear to me why Sorenson could not complete his own material, and it’s less sensible that it took two other boys to do the work. However, the changes are frequently obvious - and jarring. Wart’s voice deepens and raises from scene to scene, and it becomes quite distracting. As for the other characters, the main humans are acceptably well portrayed, and Sebastian Cabot actually adds some humanity to the poorly defined role of Ector. However, I thought the highlights of Sword came from some non-human participant. Early in the film, Merlin gives life to a sugar bowl, and that dish provided some of the movie’s best moments; there’s more spark and personality in that utensil’s brief screen moments than we see in all 75 minutes or so of Wart. Speaking of whom, one scene has Merlin transform Wart into a squirrel. In that guise, a female rodent falls in love with the boy. Animated by Frank Thomas, this girl achieves more character and life than one should reasonably expect, and when her segment comes to a bittersweet ending, Sword achieves its only moments of true emotion. That’s the kind of stuff at which Disney can excel. Their animation can bring to life squirrels and sugar pots in such a way that not only do you believe the characters, you really care about them. It’s that magic that’s largely absent from The Sword In the Stone. It’s a very serviceable movie, and it has some very entertaining moments, but it can’t maintain a sense of wonder or a spark for long. Without question, Sword is far from being Disney’s worst animated movie. In fact, it’s arguable that Disney produced nothing better over the following quarter of a century. Most would pick The Jungle Book as the best flick over the span from Sword through 1988’s Oliver and Company but I’m not sure I agree. Jungle is almost as fractured as Sword. Whatever the case may be, the possibility that Sword is one of the studio’s best efforts for such a long period is more of a condemnation of their work over that time than an endorsement of this movie. Sword has some moments but as a whole, it remains a fairly lackluster film. 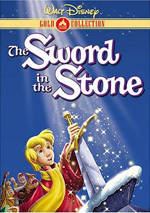 The Sword In the Stone appears in an aspect ratio of approximately 1.33:1 on this single-sided, double-layered DVD; due to those dimensions, the image has not been enhanced for 16X9 televisions. 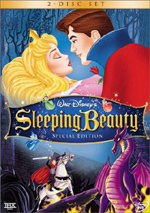 As has been the case with the other Disney DVDs that provided fullscreen images of theatrical releases - such as 101 Dalmatians and The Aristocats - some controversy has surrounded this aspect ratio. It has been extremely difficult to find out whether the movies originally appeared as 1.33:1 releases or if they were 1.75:1, as indicated on IMDB. Assuming that ratio is correct, the question then revolves around the issue of the original frame; does the fullscreen picture represent a pan and scan version of the film or is it simply an “open matter” transfer that reveals additional information not seen theatrically? In the case of Sword, I have the feeling we find a mild pan and scan affair here. For the most part, the framing seemed adequate, but at times I thought the sides appeared a little cramped. Examine the scenes in which Wart and Merlin are squirrels; when Wart is chased by the female squirrel, their tails looked a bit cropped, and I saw what seemed to be some artificial panning at times. Frankly, if this is a pan and scan job, it’s a mild one; any lost information seemed to be minor. Nonetheless, if Sword doesn’t appear in its original aspect ratio, I really wish Disney would just give us everything as intended. Whatever the case may be, Sword provided a solid image that usually looked much better than one would expect of such an old movie. Sharpness appeared nicely crisp and detailed throughout most of the film. During a few wider shots, the picture could seem a little soft and fuzzy, but these occasions were rare. As a whole, the image came across as distinct and well-defined. I saw no examples of moiré effects or jagged edges. Sword boasted a nicely varied palette, and all of its bright and vivid hues looked terrific. The movie featured a wide array of tones and they seemed wonderfully accurate and tight at all times; I saw no signs of bleeding or noise from these rich and lively colors. Blacks looked deep and solid, and shadow detail was similarly well-rendered. As one might expect from a movie past its 40th birthday, print flaws caused the greatest concerns during Sword. However, the detection of these became more complicated than usual due to some weak artwork. It looked like the filmmakers did an occasionally poor job of cleaning up the animation, as characters and effects often didn’t integrate well with the backgrounds. A variety of streaks and marks accompany many movements, and it seemed clear that these weren’t the fault of defects on the print itself; they looked like they’d always been part of the movie. Otherwise, flaws seemed minor. I witnessed a modest array of speckles and grit, and there also was a nick or two. The messiness of the original image could be annoying, but I can’t blame the transfer for problems that always existed. As such, I thought The Sword In the Stone usually presented a strong picture. In regard to the sound of Sword, the original monaural mix has been gently reconfigured into a Dolby Digital 5.1 affair. I say “gently” because the audio was really nothing more than a glorified one-track piece. This was what I call “broad mono” because although sound indeed came from all five speakers, it did not create much of an engaging environment. Instead, the audio from the side and rear channels really seemed to just echo the center speaker’s sound. Frankly, I almost never detected any non-musical activity that stemmed from anywhere but the center; it sounded to me as though all dialogue and effects emanated from that channel. As for the score and the songs, they indeed appeared in all five speakers, but as I noted, the effect was modest. The music presented a minor stereophonic presence at times, but I was hard pressed to detect any form of discrete localization of voices or instruments. This isn’t really a complaint, as I often prefer 5.1 remixes that don’t stray too far from the original material, and the soundtrack of Sword simply provided a mild extension of the source information. Nonetheless, I thought I should comment upon the lack of dimensionality. As far audio quality, it seemed fine for its era. Dialogue appeared a little thin at times, and I detected some edginess to lines spoken by Sir Ector, but as a whole the speech was acceptably distinct and relatively natural. Effects were also somewhat drab and lifeless, but they were decent for the period, and we even got a little bit of bass from them at times. For example, when the drawbridge of Sir Ector’s castle dropped, it landed with a nice thud. Music offered a modicum of bass as well, but as a whole the tunes seemed acceptably bright but without much dynamic range. Slight bass response could be heard on occasion, but it didn’t add much depth. Ultimately, the soundtrack of The Sword In the Stone seemed perfectly decent for the time frame in which it appeared, but it lacked any special qualities. Sword comes with a pretty decent collection of extras. We find some classic Disney shorts on Sword. This disc features a Goofy vehicle from 1946 called A Knight For a Day, and it also includes a Mickey Mouse program from 1938 entitled Brave Little Tailor. The Goof’s cartoon runs for seven minutes, while Mickey’s short lasts nine minutes. I expected to like “Tailor” since it’s a fairly well known and highly regarded clip, and indeed I did think it was fun. The story pits Mickey against a giant with amusing and inventive results. However, I was surprised by the quality of “Knight”. I’m not fond of Goofy, and since he plays all of the roles in this short - even Princess Penelope! - I really thought it’d be a dud. Instead, it was easily one of the best Goofy offerings I’ve seen, and I thought it was among the top Disney shorts that involve any character. Here we watch a medieval battle, the prize for which is the affection of the princess. It’s a clever, witty and just darned goofy affair that I really enjoyed. Maybe the old Goof’s not so lame after all! In addition to these shorts, the DVD tosses in a nice mix of behind the scenes materials. One of these is called Music Magic and it focuses on the work of the famed Sherman Brothers. Apparently part of a series shown on the Disney Channel, this seven-minute and 45-second piece looks at their work for Sword. They discuss what they wanted to do with their songs, and we also hear two tunes that didn’t appear in the finished film. The featurette combines new interviews with the Shermans and a mix of production stills and film clips. All in all, it’s a fun and informative program. This DVD includes a TV show from 1957 called All About Magic. Hosted by Walt and the Magic Mirror from Snow White - depicted by Hans Conried, who played Captain Hook in Peter Pan - the black and white program lasts for 37 minutes and 25 seconds. The program starts with some magic tricks and a discussion of the format, and then we go into similar talk from the Mirror. After that, we find some animated material. The show includes two shorts - “Magician Mickey” from 1937 and “Trick or Treat” from 1952 - and then find some snippets from 1950’s Cinderella. It’s not one of the most fascinating of these programs, but it’s a nice extra nonetheless. A few other minor supplements appear as well. Film Facts provides eight screens of text production notes, while the Sword In the Stone Scrapbook includes a bunch of still frame images. Presented in a true “scrapbook” format, we find two to five stills per “page” for a total of 62 pictures. These encompass production shots, character sketches, and advertising concepts plus a few other images for a nice little package. In addition, two Sing-Along Songs can be found. You can croon along with “Higitus Figitus” and “That’s What Makes the World Go ‘Round” as these pieces offer shots from the film plus Karaoke-style lyrics on the screen. Lastly, we find some ads at the DVD’s start. Here we get clips for Snow White and the Seven Dwarfs, The Hunchback of Notre Dame II, 102 Dalmatians and The Emperor’s New Groove. These also appear in the DVD’s Sneak Peeks area. After more than 40 years, 1963’s The Sword In the Stone remains one of Disney’s most ordinary animated films. Although the movie seems to boast few serious detractors, it also fails to excite many fans, and it maintains a status as a bland but mildly enjoyable offering. The DVD provides good picture plus decent sound and a nice complement of extras. Ultimately, The Sword In the Stone will make a good addition to the collections of serious Disney fans, but those who are less wild about the studio’s output may not be as interested; it’s a decent movie but not one that deserves much praise.